Small cars + Heavy people = Mechanical issues? We all know that society as a whole is getting heavier, bigger, fatter. I know several larger people who will freely admit that they are not comfortable in a small car because they're bigger, and that's fine. 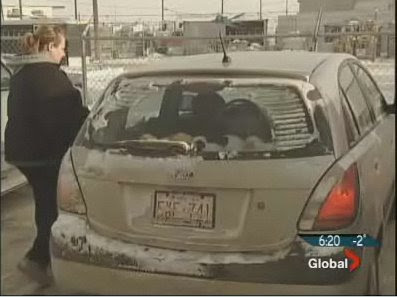 Now, out of Edmonton, Alberta Canada comes the story of a woman who says the local Kia dealership allegedly told her the reason her Kia Rio wasn't holding an alignment was because of her weight. The woman said the dealership's solution, after two alignments failed to correct the problem, was to have her sit in the car while the vehicle was getting an alignment, which she found embarrassing and humiliating. Kia denies the allegation that the dealership suggested she be in the car during the alignment, but did admit there were problems with the situation. The dealership, Kia West Edmonton acknowledged, "The person handling the situation made some serious mistakes, and didn't handle it in the proper fashion." Kia did conclude that the alignment was not caused by the woman's weight, and there was indeed an issue with the car itself. Kia has said it will work with the woman to fix the issue. The woman hopes her story will "make manufacturers more aware of our growing society." Below is a link to the video from Global Edmonton. No doubt, a larger vehicle isn't going to be effected by the weight of an individual as much as a Kia Rio or other subcompact. However, should manufacturers make vehicles, especially smaller cars, more mechanically stout to accommodate our ever-enlarging society? I find this hilarious. My xB handles my large frame pretty well, but I'm not on stock suspension either. Great Blog you got here. If this woman walked into Express and they didn't sell clothes in her size, would she get mad about that, too? Society shouldn't have to conform to the problems of others unless those problems are unavoidable. She isn't blind. She is unhealthy. That can be corrected. It is also obvious that her car's alignment is only the icing on the cake, excuse the pun.